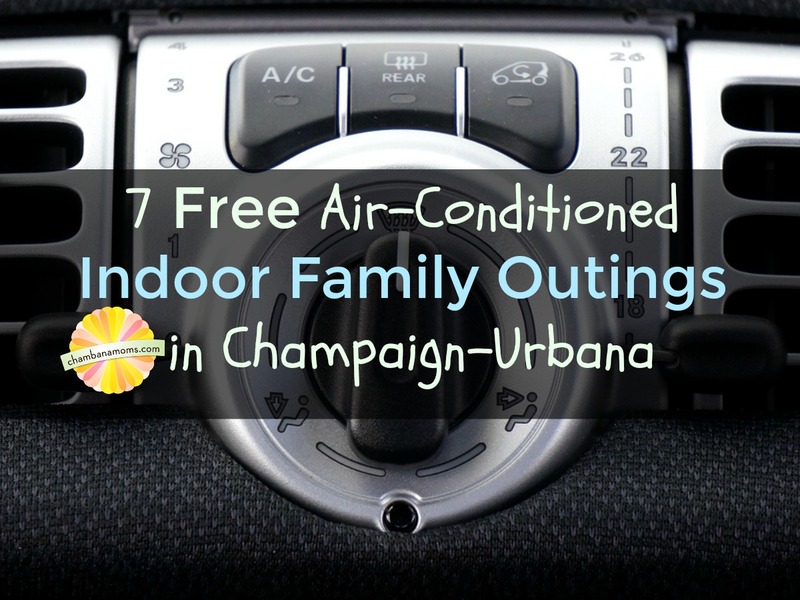 Do you need a place to to cool off the kids — but you’re sticking to a budget? Of course we have our Free Indoor Playground Guide, but we’ve added some obvious and not-so-obvious additional ideas here. Local Libraries with Play Spaces – We love our local libraries. There are plenty of fun things to do at the Urbana Free Library (think pretend area plus games, puzzles and more); the Champaign Public Library which has the ever popular puppet theater, puzzles, LEGO table and more; and the play area. Look at our calendar, sponsored by Busey Bank, to find free and fun indoor events at libraries going on all summer. Free Museums – There’s never been a better time to visit local free museums including Mahomet’s Museum of the Grand Prairie, which recently opened a new temporary exhibit, on loan from the Smithsonian, all about water. The Spurlock Museum in Urbana is also open this summer, and has two temporary exhibits closing on July 31. Both have special events as well. The Giertz Gallery at Parkland College is open this summer but only Monday through Thursday. (The Krannert Art Museum is closed for the summer, undergoing renovations). Let the kids run off energy at Lincoln Square – There isn’t a playground here, but there’s plenty of things for kids to do, from trying out games at Dr. G’s Brainworks to getting a free piece of fruit at Common Ground Food Co-Op (become part of the Explorers program). Also: wide open indoor space. Head to campus – We mentioned the museums, but one of our favorite places to explore is the Illini Union. Kids love the fish tank in the lobby. Downstairs, enjoy the bowling alley and games (and don’t miss the early bird specials or $2 Tuesday). There’s also the food court. It could be as cheap (or expensive) as you want. Willard Airport – I remember my dad telling me he used to go to the airport in his city while growing up, and would ride the escalators. OK, so there’s only one at our airport, but my kids love that. Time it so you can watch the planes take off. This is a little tricky due to security regulations, but the airport is a public – and air-conditioned – place that can be a great field trip for little ones. Ride the Bus – Speaking of transportation, take a trip around town on our very cool CUMTD buses. OK, this isn’t exactly free – grownups pay $1 per trip, but children who are 46 inches or shorter in height may ride free when accompanied by a fare-paying passenger. If your kids aren’t used to riding the bus, this is a great treat. Go to the Illinois Terminal in downtown Champaign and look at all the sculptures there; time your visit with an Amtrak train, if your kids are into that. Know of any more secret spots to cool off when the temps get high? Please let us know!